In this article, we continue to explore mobile bases and how they can be used to increase warehouse storage while preserving selectivity. Here are two examples of using mobile raking in cold storage warehouses. Cold storage is of course one of the most expensive storage applications due to high cost of building an insulated and heated floor, plus the high cost of cooling the air. 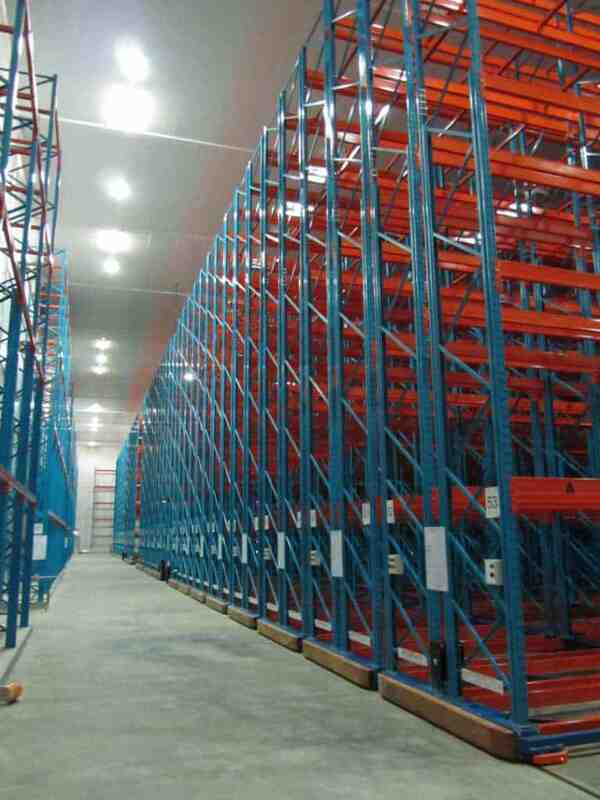 Increasing storage capacity without losing selectivity is possible using mobile racking. mobiles use automatic aisle clearing which is activated by the reach truck masts. This speeds up the movement of the bases. The front of each base is protected by a locally produced wooden bumper. These absorb the occasional reach truck impact and protect the push button stations. 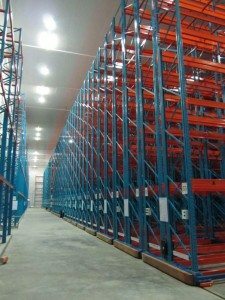 The cold storage warehouse has a maximum capacity of over 8000 pallets and incorporates the latest energy saving features including automatic aisle light switching. 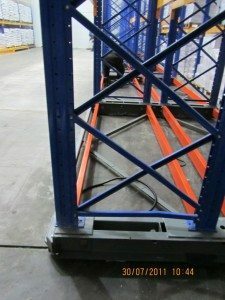 When this freezer warehouse was built, budgetary constraints dictated that only the rails together with selective fixed racking were initially installed. Three years later, an acute shortage of storage space meant that the Storax bases had to be installed at operating temperatures of minus 20 degrees C (-4 F). Using European standard cold store suits, locally trained technicians commissioned the 5 bases in just over 10 days. Building Storax bases in an operating cold store requires good planning as the normal activities must continue. 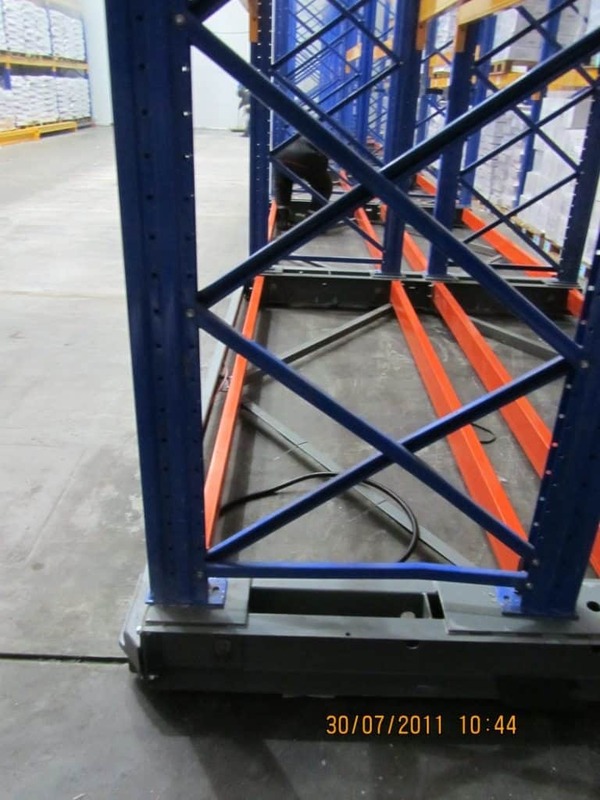 Special fork extensions were made to lift the existing selective racking onto the new bases. Stacked 6 pallets high the freezer capacity increased from 794 to 1412 pallets when the Storax mobiles were installed. Storax mobiles can store just about anything. In the UK, for example, English Heritage has a Storax system which stores Roman and medieval artefacts. Wherever storage space is expensive and immediate individual access important, Storax mobiles can often be a very cost effective solution. To know more about what Storax mobile racking, visit BarPro Storage’s website at www.barprostorage.co.za or email James Cunningham. You can also find more information on Barpro Storage’s blog. View of the mobile bases being built inside the freezer room.